A winning attitude can carry a team a long way. This year, a hugely positive outlook—combined with an involved coach and an increase in players—is translating the Women’s Lacrosse Team’s winning attitude into a winning season, in more ways than one. The team is already off to a strong start after winning their first game of the season against Trinity 14-7. After practicing hard all fall, these women are seeing that their effort has truly paid off. In September, women’s lacrosse hosted a new player clinic and enjoyed a phenomenal turn out. The team is a club organization focused on creating a strong camaraderie both on and off the field. A majority of the players on the team had never held a lacrosse stick in their lives before joining the group at SHSU. The team’s increased volume lends the ability to push harder and reach farther. In previous seasons with fewer players exhaustion would affect the way the women could play. In addition to increased player volume, the team is also taking advantage of their full-time coach, SHSU alumna Allisa Blanton. SHSU's Women's Lacrosse team discusses why they play and the rules of the game (above) and show off their skills during practice (below). From a coaching standpoint, Blanton found that increased membership also meant a spike in internal motivation for individuals who would benefit the team as a whole. “Before, when we only had a handful of girls, they couldn’t push each other as much,” said Blanton. “Now that we have 20 players, they can all really push each other to improve, especially now that our 20 players are fighting for 12 spots. Although winning is an important goal for Women’s Lacrosse, it is not the team’s first priority. “I remember when we played Baylor last year,” said Blanton. “We scored one goal all game and they scored 11. When we made that goal we celebrated like crazy. It’s this winning attitude that attracts so many women to this organization, according to sophomore and vice president for the team Kathleen Geuea. The women’s lacrosse team comprises an extremely diverse group of women, from members of sororities to members of the armed forces. While some would assume that this diversity could cause divisiveness within the group, officers of the organization find pride in the strong sense of unity within the team. The women’s lacrosse team continues to push in order to make their presence as an organization and a sport known on campus. “People up north play lacrosse like crazy, it’s an interesting sport, I just don’t think many people around here are aware of it,” Albrecht said. De La Morena acknowledges the challenges that come with promoting a lesser-known sport. Although the season of play is underway, women’s lacrosse is still welcoming interested players with open arms. 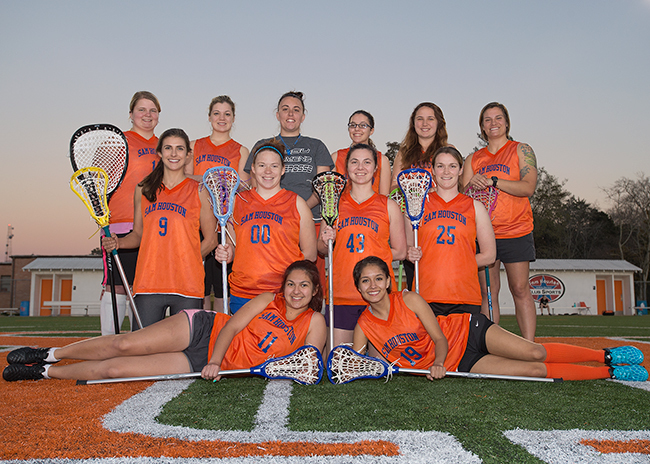 Those interested in learning more about Women’s Lacrosse at SHSU can contact De La Morena at mnd017@shsu.edu.